From the moment I was diagnosed with bone cancer at 21, cancer advocacy has been a driving force in my life. Cancer is the one thing I think about every day, spurring a range of emotions, sometimes multiple at once (that makes for interesting moments). I have been a cancer survivor for almost longer than I have not (and I am so grateful every day). This recognition also makes me very grateful to be a lead volunteer for the American Cancer Society Cancer Action Network in my Congressional District. I get to work with local, state and federal legislators, staff and other cancer advocates to work to make a positive impact in the lives of cancer survivors and strive to make this disease a distant memory. We stand together to help others. I’ve shared the many times that I’ve had the honor to go to Washington, DC to advocate for improvements in cancer issues. And I’m excited to share that I’ll be heading to DC in September with ACS CAN for the annual leadership summit and lobby day. Hundreds of cancer advocates will come together to learn how we can make a greater impact in this fight, then head to the Hill for meetings with our senators and representatives, ensuring they also are keeping cancer issues at the forefront of priorities. I love this type of work, being part of helping others, ensuring hope remains bright and strong for more than 16 million cancer survivors in the United States and the thousands who will be protected from cancer with preventive screenings and access to quality healthcare. While in DC, we’ll participate in one of my favorite events – ACS CAN’s Lights of Hope ceremony. 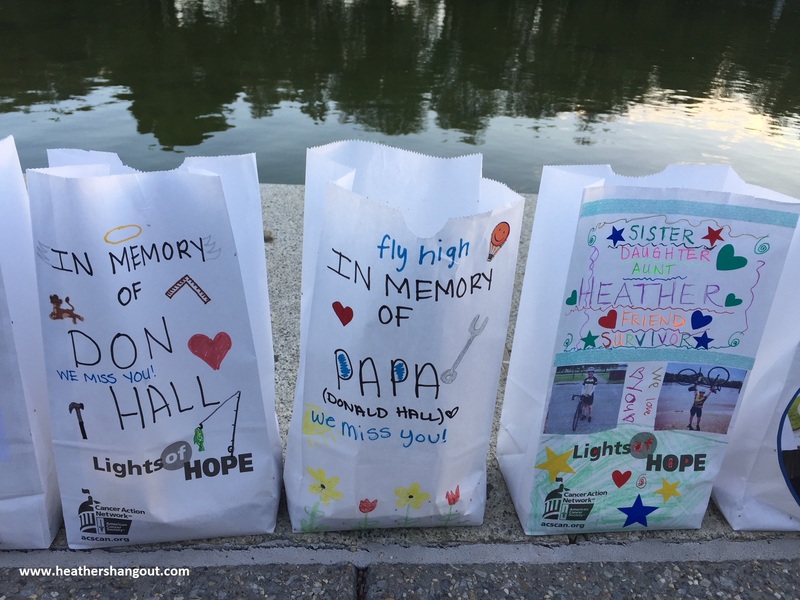 More than 25,000 luminary bags will line the reflecting pool and the steps of the Lincoln Memorial. For some, the ceremony is a celebration of survivorship. But, for far too many, it’s a remembrance of someone who was lost to this dreaded disease. For my family and me, it’s a story of both – grateful I am a bone cancer survivor, and heartbroken to lose my dad to cancer. You can honor someone with a Light Of HOPE bag at this ceremony. Each Light of HOPE bag represents a minimum of a $10 donation to the American Cancer Society Cancer Action Network. Your bag will be personalized with the name of the person you’re honoring and placed in front of the Lincoln Memorial Reflecting Pool as part of this moving evening. Last year was my first year attending the Lights of Hope ceremony in person (read about that experience). I had seen pictures, heard stories of the emotional moments. But I didn’t really understand the beautiful impact of witnessing this event, these personal stories that every luminary shares. And then I stood on the edge of the Lincoln Memorial reflecting pool. It was my birthday. Twenty years earlier, I spent my birthday in the hospital sick from chemo. So it was pretty powerful to be advocating in DC on that day. The Lights of Hope ceremony was a most touching finale to a beautiful birthday. 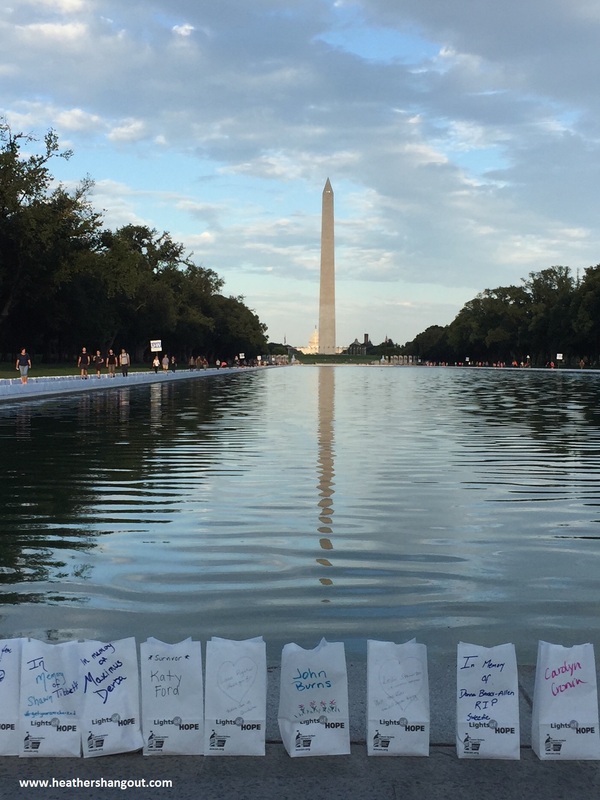 I recall standing at the reflecting pool, so many emotions flowing, eyes wandering around the thousands of glowing bags. All people touched by cancer. Too many people affected by cancer. My dad’s and my luminary bags were next to each other (out of thousands, how amazing is that sign?). And in those very emotional moments during that beautiful ceremony, I knew I was right where I needed and wanted to be. Fighting this disease. Giving a voice to millions who are no longer here, but speak so loud with their stories. Standing strong with so many others. Every person touched by cancer has a story, and every story makes an impact on the fight against cancer. To change the direction of statistics, create new drugs, access affordable healthcare, achieve health equity, inspire and motivate others. Whose story will you share? Order your Lights of Hope luminary bag here and join thousands of others in standing up to cancer. Add your voice to the fight against cancer – join your state’s ACS Cancer Action Network.